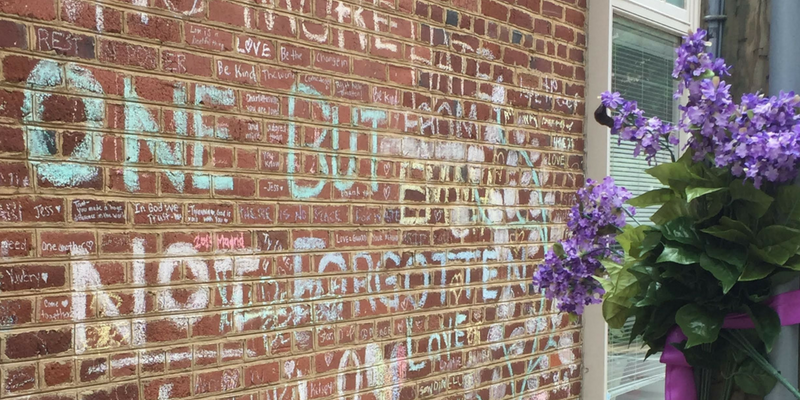 As the anniversary of the tragic events of August 12 approaches, something I have sensed among people in Charlottesville, as well as in me, is the anxiety of uncertainty. Many of us find ourselves wrestling with a myriad of questions. What is going to happen? How do we prepare for the unknown? What will the next few days reveal? How do we move forward? While only God knows the answers to all these questions, moments when we do not yet have the answers we long for are often the times when we must cling even more tightly to the things we know to be true. The truth is that the forces of evil will never have the final victory, and that we serve a God who is establishing a kingdom against which he promises the gates of hell will never prevail. Although we do not yet know how this weekend will ultimately take shape, I am convinced that this is a time for us to stop and remember. It is first and foremost a time to remember the lives that were tragically lost last August. It is a time to remember our collective trauma and our ongoing need for healing. Yet it is also a time to remember that we serve a God who actually has the power to mend the brokenhearted and heal our collective wounds. A time to remember that the pain and suffering in our world will never undermine the truth that God remains God. This affirmation of God’s power is not a naïve or blind optimism that settles for easy answers while avoiding the reality of suffering. Instead it’s a way for us to acknowledge the reality of a broken world alongside the truth that our God remains in the process of redeeming it. At Abundant Life we have seen glimpses of God’s work as he has recently provided amazing opportunities for us to invest in mutually transformative relationships with our neighbors, and we see glimpses as we anticipate churches from around our city gathering together the evening of August 12th to lift up prayers and praise to God. The truth is that God is at work. My prayer is that God would give all of us the grace and the wisdom to join him. We at Abundant Life will continue to pray for our city, that God would heal and lead us, and we invite you to join us in praying as well. We remain grateful to and for you. God bless. Next My Abundant Life Story: Hannibal Reid Jr.